Kagoshima Prefecture (鹿児島県, Kagoshima-ken) is a prefecture of Japan on the island of Kyushu. The capital city is Kagoshima. 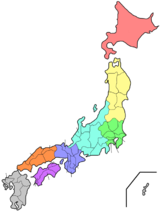 Kagoshima Prefecture is made from the old provinces of Ōsumi and Satsuma, including the northern part of the Ryukyu Islands. During the Sengoku period and Edo period, Ōsumi was controlled by the Shimazu clan of Satsuma. This region played a key role in the Meiji Restoration. Important historical figures from Kagoshima are Saigo Takamori and Tōgō Heihachirō. 713 (Wadō 6, 3rd month) – Ōsumi Province was separated from Hyūga Province. Kagoshima borders Kumamoto Prefecture and Miyazaki Prefecture. It is in the southern part of Kyushu facing the Pacific Ocean. Kagoshima jinja, Hirasaki jinja and Nitta Hachiman-gū are the chief Shinto shrines (ichinomiya) in the prefecture. ↑ Nussbaum, Louis-Frédéric. (2005). "Kagoshima prefecture" in Japan Encyclopedia, p. 447; Japan External Trade Organization (JETRO), Kagoshima Prefecture, Regional Information; retrieved 2012-4-6. ↑ Nussbaum, "Kagoshima" at p. 447. ↑ 4.0 4.1 History of Kagoshima; retrieved 2012-2-4. ↑ History of the Catholic Church in Japan; retrieved 2012-2-4. ↑ Davison, C. "The Sakura-Jima Eruption of January, 1914," Nature. 98:57-58 (21 September 1916), doi:10.1038/098057b0; Illustrated London News. January 24, 1914; retrieved 2012-2-4. ↑ Kyushu Shinkansen Kagoshima Route; retrieved 2012-2-4. ↑ "Nationwide List of Ichinomiya," p. 3; retrieved 2012-2-4. This page was last changed on 29 December 2017, at 18:39.